The shelter is one of the most important parts. 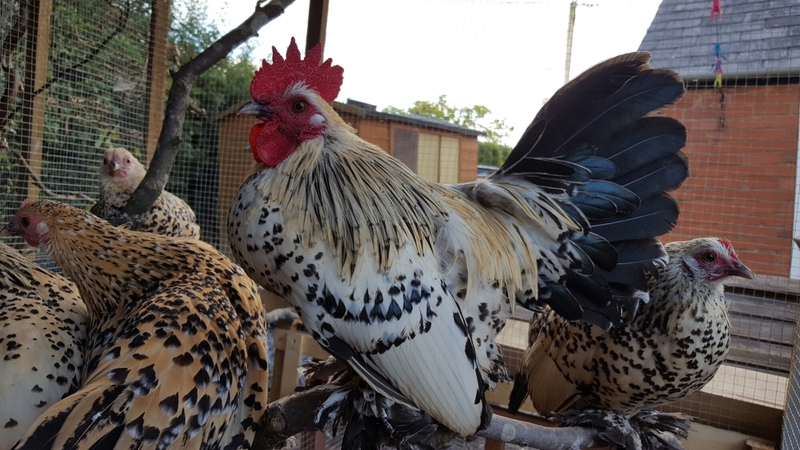 I’d seen one that used a 6×4 shed with no front to it with branches at half height for them to roost on. 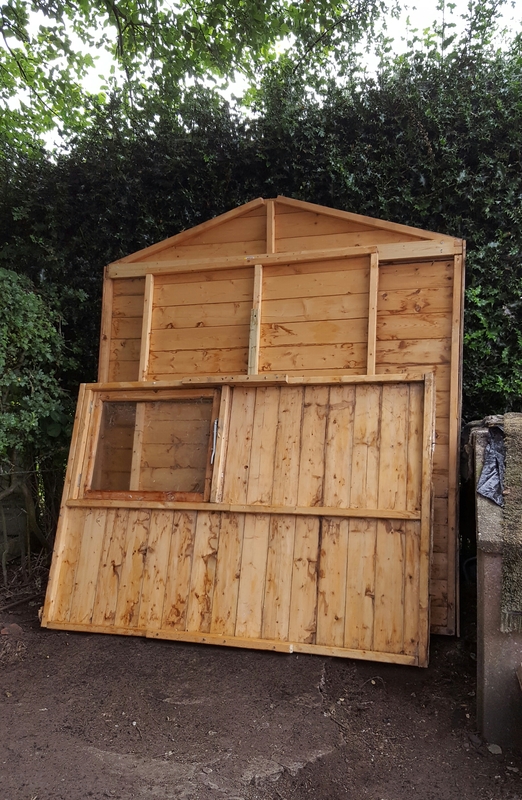 Great idea but a decent shed is hard to find for £200, with luck £100 for a good second hand one (no point in buying anything half rotten or so flimsy it won’t move well or last). I didn’t just have luck but a great deal of luck! 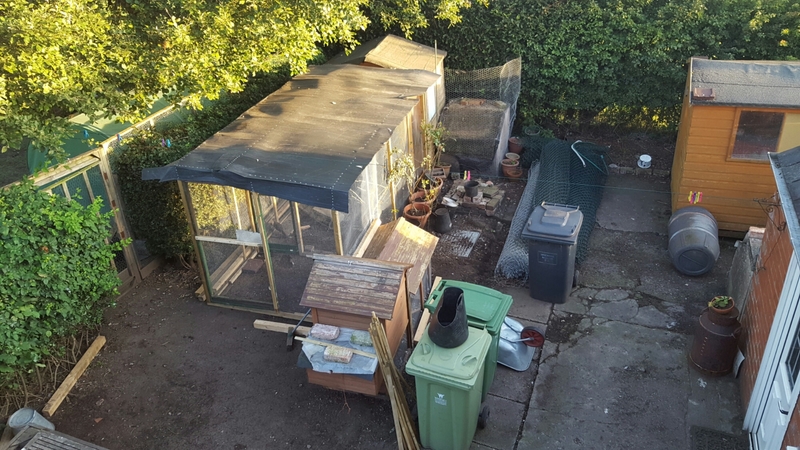 I saw a 6×4 shed on Gumtree for only £25 and secured a view. 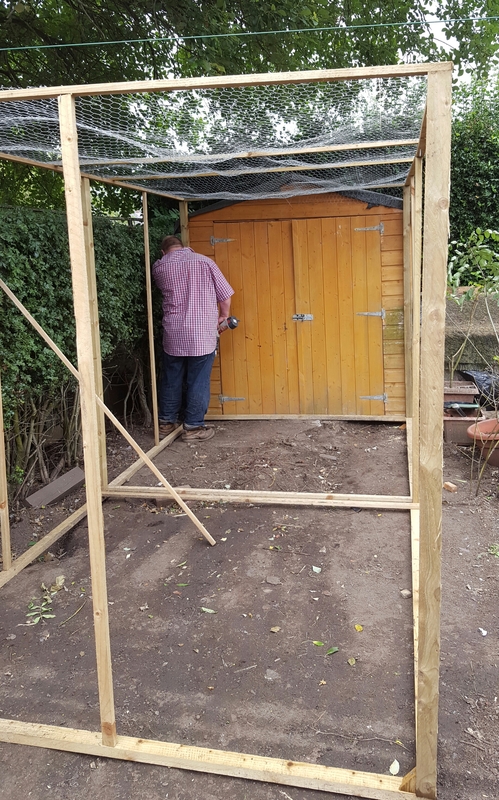 It was a pent shed rather than an apex one, i.e., the doors are on one of the long sides, which was perfect for what I wanted, and I bought it there and then. The next trick was getting it in the car. It’s not a large car and cannot take things 4ft or more wide. Let alone 6ft long or tall! 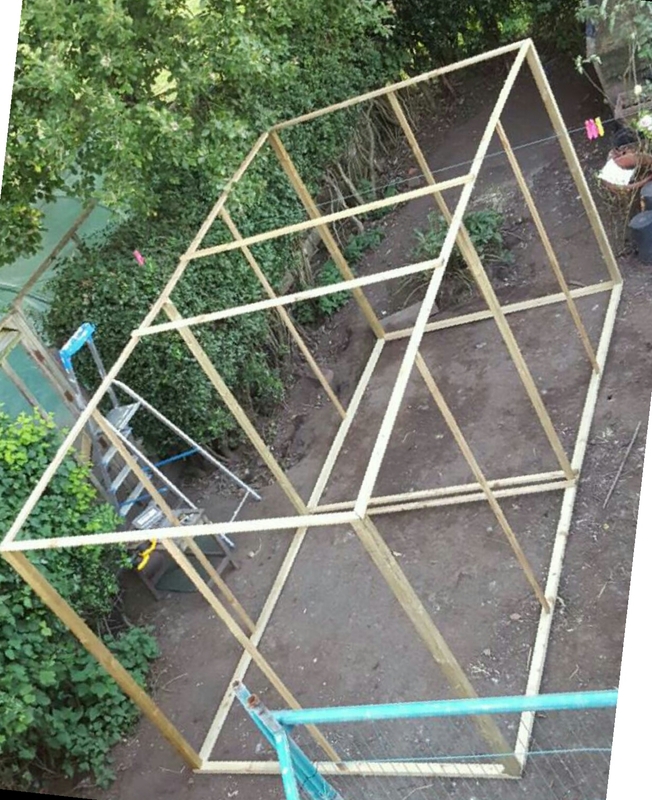 The back section was a triangular piece on top of two sections that were about 5ft high and 3ft wide. 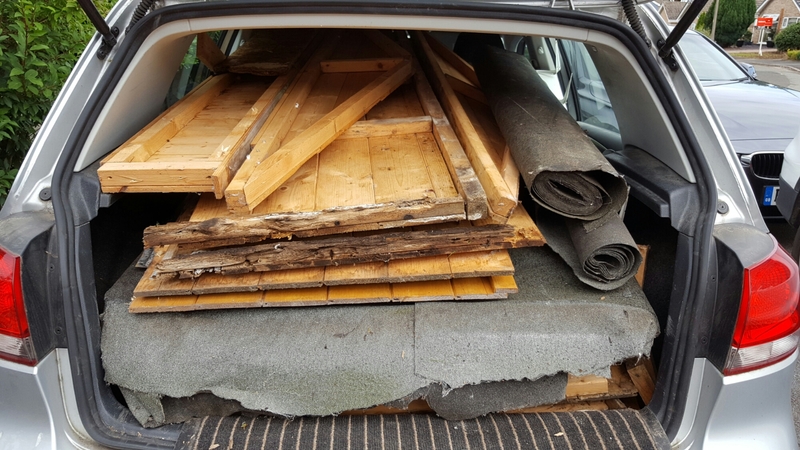 They came apart easily into sections that fitted easily into the car. The same with the doors and door surround. The roof literally folded in half. 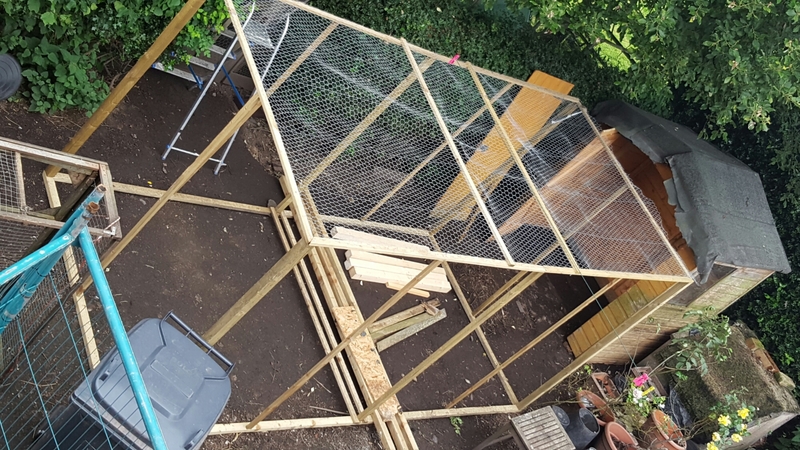 The two 4ft by approx 5ft sides though I, erm, sawed in half!! (And the floor too though I doubted I’d need it but reckoned I could always use it for something else.) Then all in the car, brushing off the spiders and cobwebs in a vain attempt to not take them too. He threw in some spare rolls of felt too. Bargain! Daryl helped me reassemble the sides and the back sections. … which was then firmly attached. And suddenly it felt like it was really taking shape. 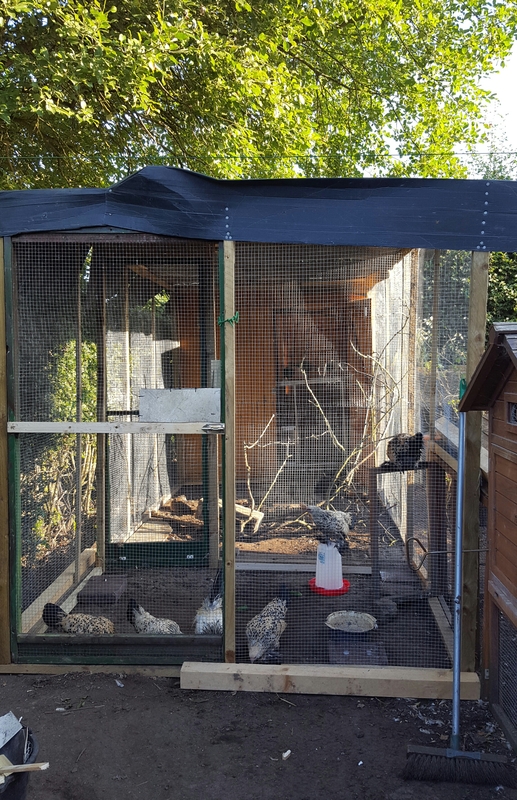 I used corrugated plastic sheeting I had lying around for the roof [free]. There was just enough. 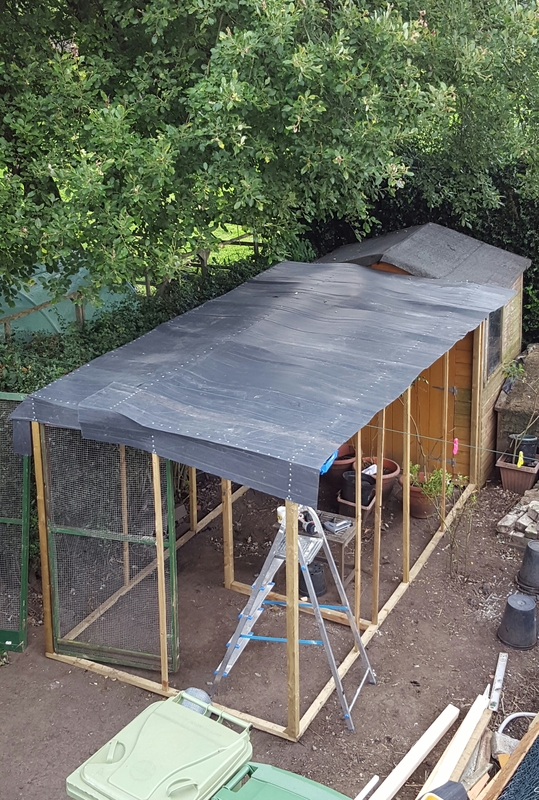 I have done it so the wind will go in between overlapping sheets rather than blow the whole roof off. 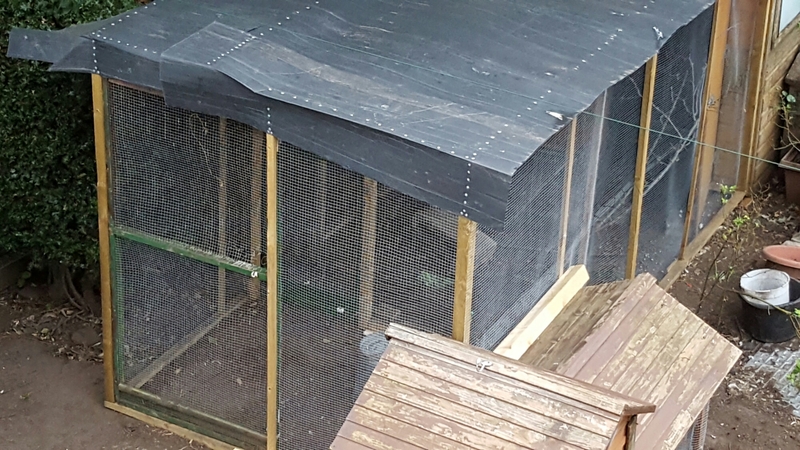 The doors were part of all the ex-aviary bits I got with the ornamentals. 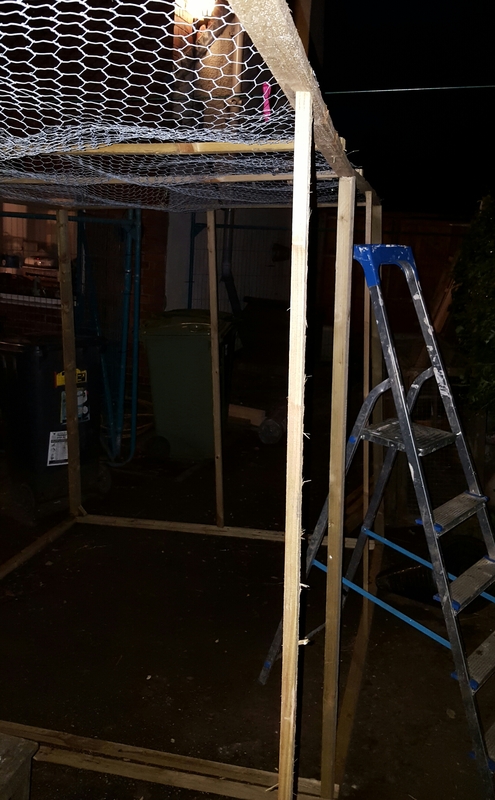 My Mum helped me do the mesh lengths. 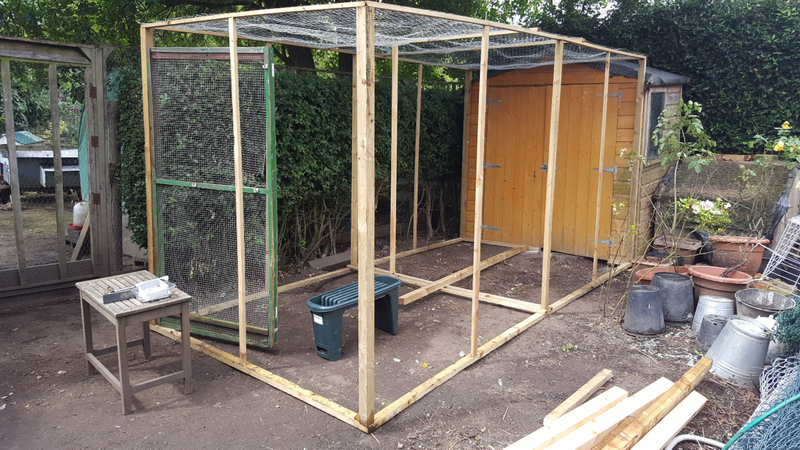 3ft width 1/2″ galvanised aviary mesh (cost £25 inc delivery and staples £5) done horizontally, giving the whole structure integrity. 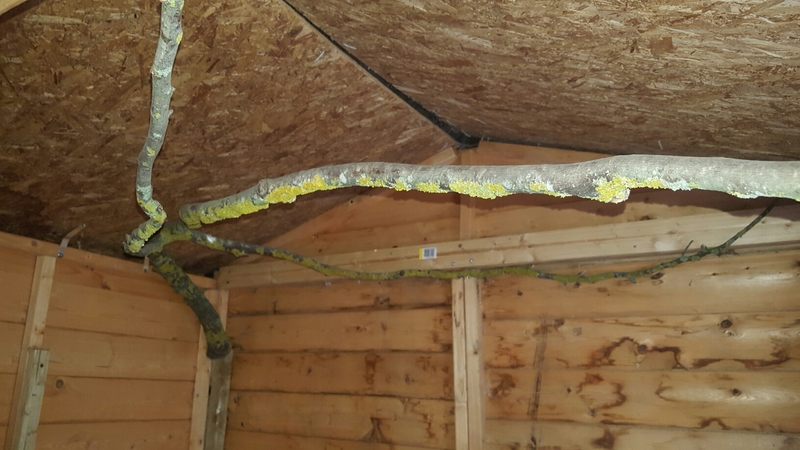 Put some big branches in the shed and run………. 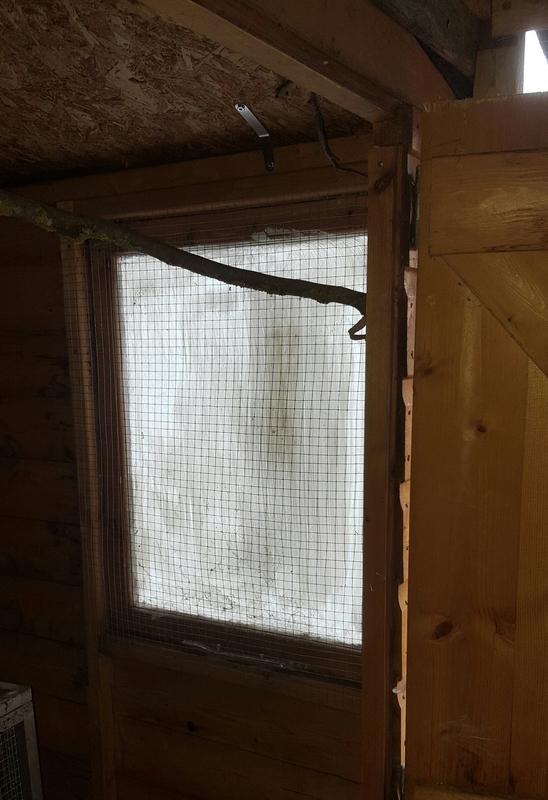 Painted the window and put mesh over it……..
and finally at 8pm was ready to release them! 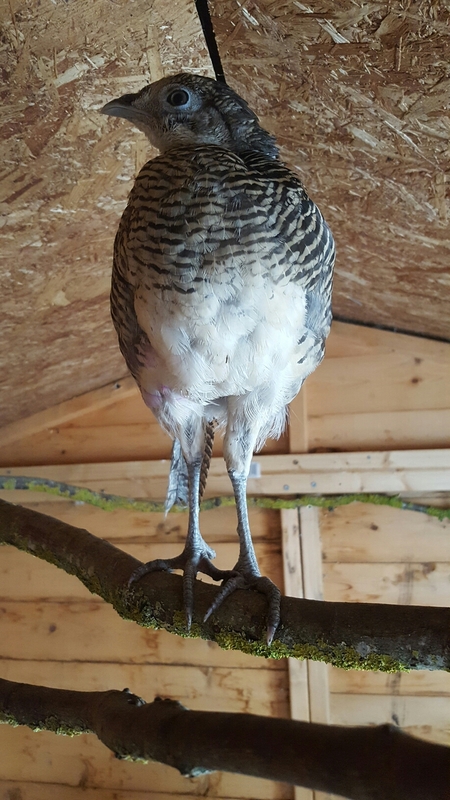 One up on the branches in the shed. 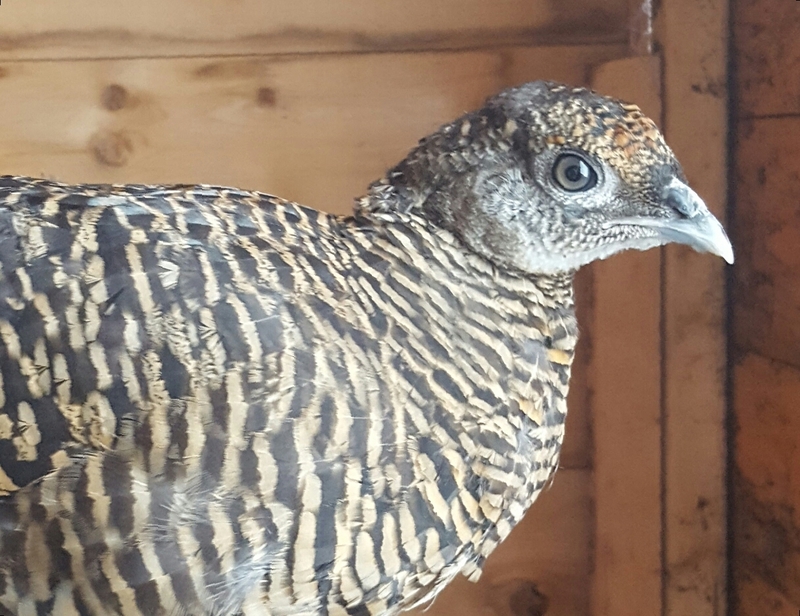 You can see traces of purple dye on its belly – one of the ones I hatched. Altogether there are 10. I plan to keep 1 boy unrelated to 2 girls. 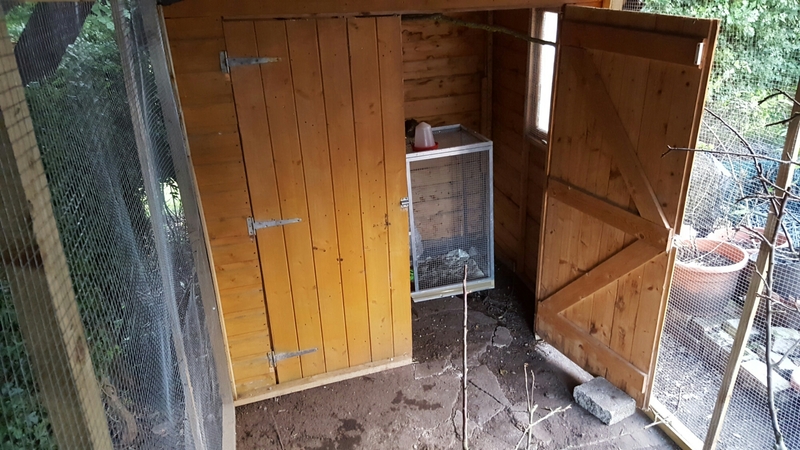 …with the lower extra length temporarily fixed around their coop so that if ever it is moved the aviary can be made whole. They too are very happy. 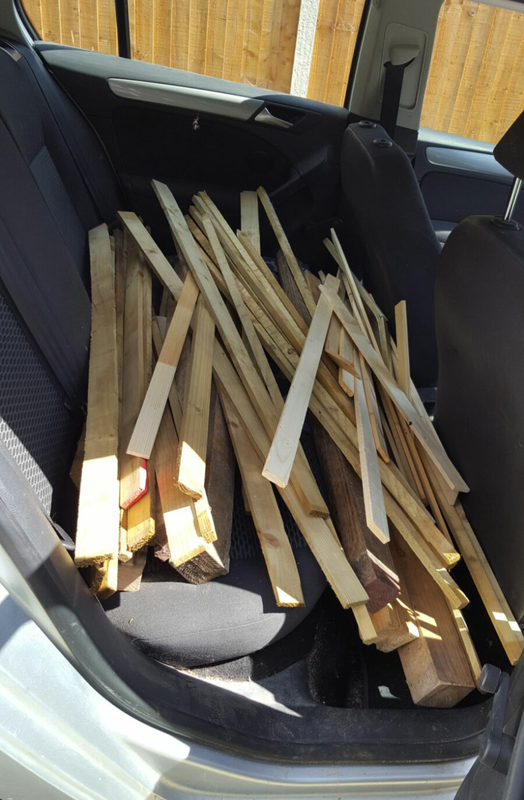 Ultimately – soon hopefully – they’ll have a lot more room. 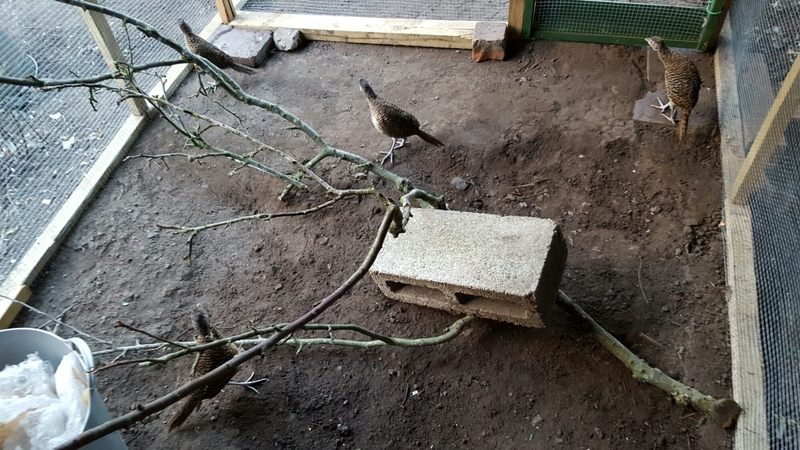 Every night they roost on the branches so I have to carry them one by one to bed. 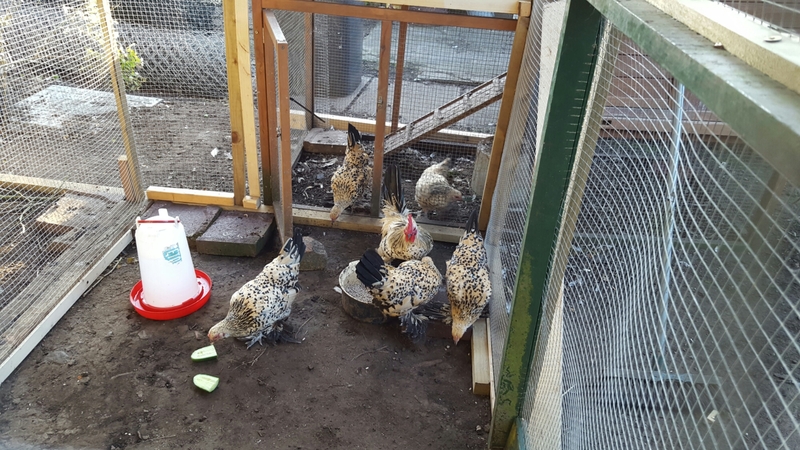 The coop does partly muffle Elton’s crowing in the morning! Here it is from the end. I may replace this door with a narrower one as now they too have branches it’s a bit of squeeze to get in and shut the door comfortably. The view from upstairs looking out the back. 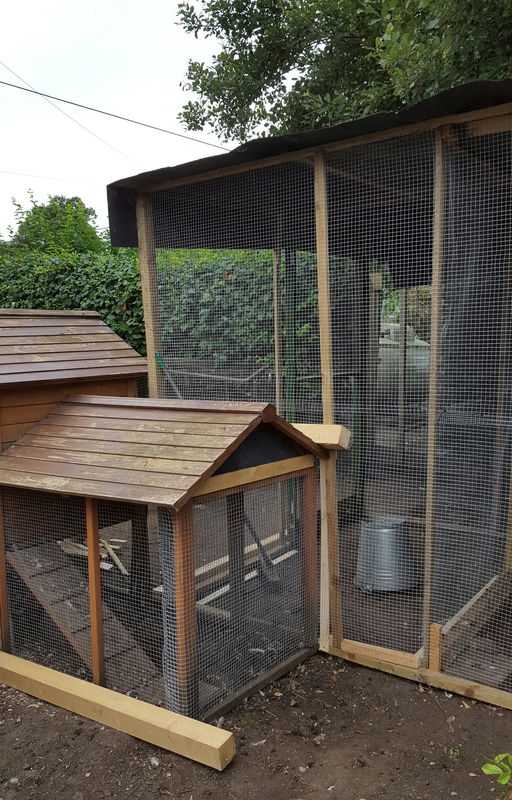 A lot of hard work but worth it, most especially to see the birds so much happier – and all for under £100.